The Gallery on the Oppo R5 is a custom job, but surprisingly one with less features than the vanilla app. Obviously, Oppo has approached this interface with a less-is-more tactic. 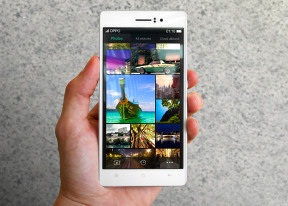 The Oppo R5 comes with a pretty simple-looking video player, which supports DivX, AVI, MKV, MP4, etc. We had no issues playing files all the way up to 1080p resolution and the only real setback were certain files with XviD video or AC3 sound. While watching a video you get a timeline scrubber, play/pause along with forward/back controls, a lock option (which locks the display against accidental touches) and a pop up toggle. We weren't very optimistic about the Oppo R5 audio output - the lack of a dedicated 3.5mm audio jack means that the smartphone had to use its microUSB for sound-feeding purposes and similar attempts in the past have shown that it's not a great idea. Besides, the very slim waistline is a challenge on its own as some audio components require more physical room to prevent interference. As it turned out, the Oppo R5 sound output isn't as bad as we feared it might be, even if it's not quite the best around. The smartphone was nicely loud when used with an active external amplifier and had no issues with its scores outside of the rather high intermodulation distortion. 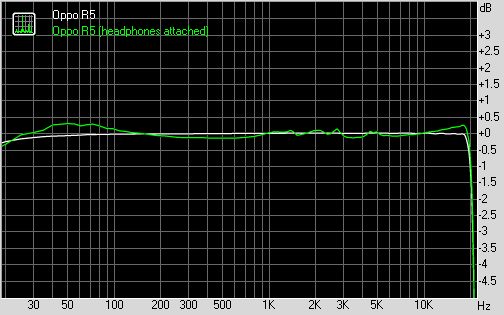 Plugging in a pair of headphones lead to a reasonably contained hike in stereo crosstalk as well as some deviation in the frequency response. The volume levels also dropped to average levels so we had to drop the overall score from very good to decent. It's certainly better than some other super slim phones we've tested recently and that's a win in its own right.